Enjoy a beautiful San Francisco weekend at The Stern Grove Festival, celebrating its 77th season. This admission-free performing arts series, takes place in Sigmund Stern Grove, a beautiful outdoor amphitheater located at 19th Avenue and Sloat Boulevard in San Francisco. With all the buzz surrounding the recent growth and changes in Dogpatch, it’s important to keep one important detail in mind; the greatest changes are yet to come. In the 1990s, when real estate developers discovered Dogpatch, they changed the neighborhood’s demographics. In to what had been a blue-collar area came a wave of young professionals who snapped up small condominiums and live/work loft spaces. They were drawn by modest prices and the Dogpatch’s easy access to downtown and Mission Bay, thanks to the new T-Third Street light rail line. In their wake came new restaurants, shops and a sudden realization of Dogpatch as a neighborhood with a high ceiling for development – one that remains vital, two decades later. In fact, the drive to build in Dogpatch is greater now than it has ever been. As of this writing there are six separate residential developments (plus two parks) either proposed or underway in Dogpatch. If they all make it to completion they will add almost 1,000 new residential units (plus new retail and commercial space) to the neighborhood. On their heels comes the long-gestating Pier 70 project, which could add another 1,000 units. Dogpatch was booming. Dogpatch is booming. What does that leave for buyers looking to get in ahead of the next wave? Plenty. For one, the neighborhood’s original condo and loft buildings are now established and well into the resale stage. Condos in Dogpatch aren’t large – most have one or two bedrooms – but many they sell for well below San Francisco’s million-dollar-plus median. Even units at the splashy former Esprit Factory, which was converted into high design living spaces in 2009, can be had in the $700,000 – $800,000 range. Note however that newer and larger units, like the ones at the newly completed Millwheel North building at 1275 Indiana Street, can fetch seven figures. As Dogpatch evolves, it evolves upward, like all of San Francisco. Beside these newer buildings (note, too, that besides Millwheel North there will soon also be new apartments at The Gantry, almost complete and adjacent to Pier 70 at 2121 Third Street) Dogpatch offers a smattering of Edwardian and Victorian units and the rarely available original Eastlake Victorian single-family cottage. Beware the desirability of the latter breed, however; a completely gutted Dogpatch Victorian, one of the neighborhood’s original 19th-century Eastlake cottages, went on the market in late 2013 for $799,000. Two weeks later it was gone, sold for $1.152 million. The next wave of Dogpatch housing will be mid-rise, limited to five or six stories mostly, though there is preliminary talk of waiving the city’s height limit for the building at Pier 70. Many of the new complexes will emphasize urban, eco-friendly lifestyles, with almost an equal number of auto and bicycle parking spots, pedestrian plazas and groundfloor retail space. 650 Indiana, which hopes to bring 111 new units to the district and will be adjacent to the proposed 8,000 square-foot Dog Patch Arts Plaza, will include a 1,700 square-foot “arts café” and a bike shop. Nearby 800 Indiana, which promises 338 residences and three public plazas, hopes to integrate a new dog park and a “dog washing station” to its proposal. Dogpatch is not just getting bigger; it’s evolving to meet the needs of modern living as its profile rises. As more people realize its advantages – interesting, diverse architecture, buzz-worthy new restaurants and shops and easy access to Mission Bay, downtown and highways leading south, Dogpatch finds itself on the verge of becoming a much larger player in San Francisco real estate. 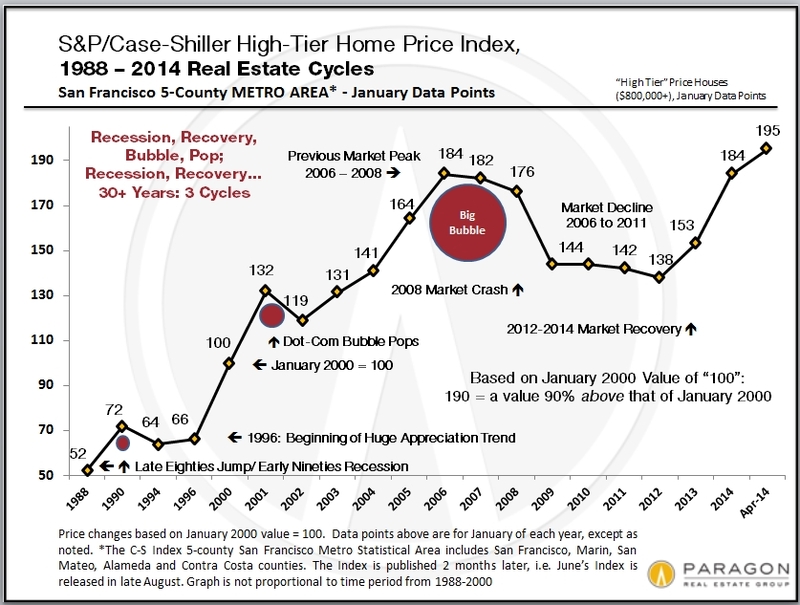 The new S&P Case-Shiller Home Price Index for April 2014 came out today and it showed another bump in home prices for the 5-county San Francisco Metro Statistical Area. 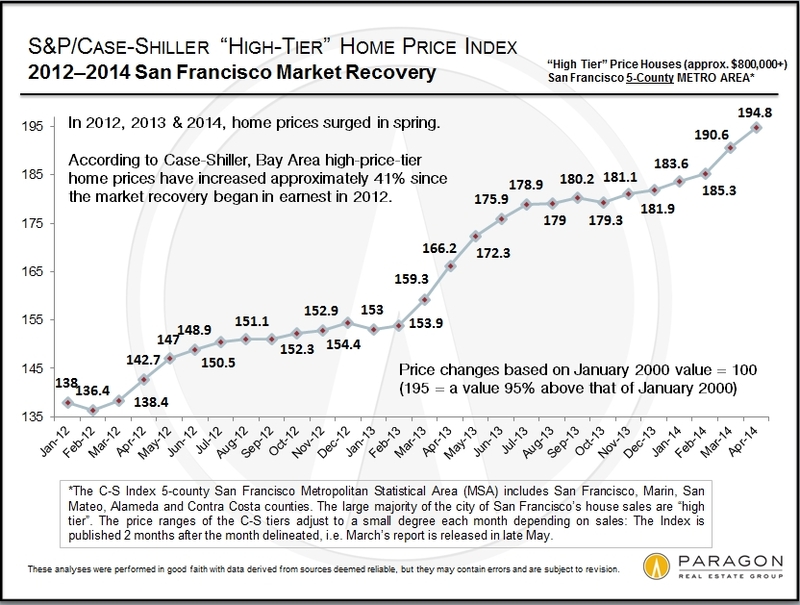 For homes in the upper tier of home values – as most of San Francisco’s are – prices are up approximately 17% in the past 12 months and up 41% since the recovery began in early 2012. Based upon what we are seeing on the ground in the market, we expect another bump in the May Index, which will come out at the end of July. Those in the know recognize West Portal as a quaint, walkable retail and residential district. It looks, however, as though those in the know are increasing in numbers. That’s according to the San Francisco Chronicle, which reports that while off the beaten path, the neighborhood, among others, is beginning to appeal more strongly to buyers. So what exactly is going on? According to the Chron, an informal survey reveals that agents are finding that the latest up-and-coming areas for buyers, in addition to West Portal, include the Excelsior, Crocker-Amazon and Mission Terrace. 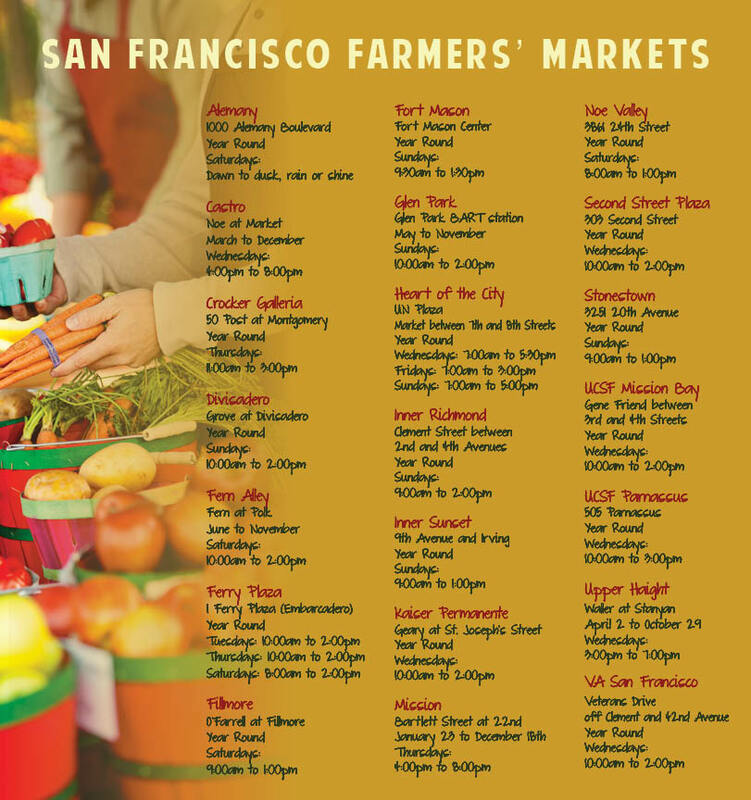 In the article, the Chron questions whether West Portal is the new Noe Valley. I would say that West Portal’s walkability factor plays a large role in its appreciation. The architecture comes from a later period than Noe; stucco bungalows and large gracious Mediterranean homes are common. It’s not unusual to find ones that have the magic three bedrooms and two bathrooms on one level – and those are the ones that are going for a premium. As for West Portal Avenue, it enjoys a light-rail stop on one end and is lined with coffee shops, restaurants and some retail stores. It has not yet gone upscale in terms of the businesses and products they sell. The main reason West Portal seems like a value is the weather. It is west of Twin Peaks and gets more fog. Kevin Birmingham of Park North Real Estate Group chimed in that West Portal is becoming a likely alternative for already-hot neighborhoods such as Noe Valley. What’s your opinion? As the economy recovered, Givas moved into condo development. However, he started with smaller developments such as the 98-unit Marlow project at 1788 Clay Street. Oyster is now looking to go bigger. Recently it has gotten approvals for a project at 1634 and 1690 Pine Street – 261 residential units in two 13-story towers with 4,000 square feet of commercial space. Givas said he wants to break ground by October and kick off sales by Spring 2015, but still needs to get construction financing. According to The Mark Co.’s pricing index for penthouse units, the average San Francisco penthouse in April (a 30th floor, 2,000-square-foot unit) was priced at $1,915 per square foot. In terms of resales, the average price of a San Francisco condo hit $927 per square foot in April; that figure is based on approximately 307 units changing owners. Restaurants, bars, music, dance, running, biking, things to do with kids or guests or dogs, and anything else we could think of. It stands to reason that the less an item is available, the more competitive buyers will become in obtaining it. 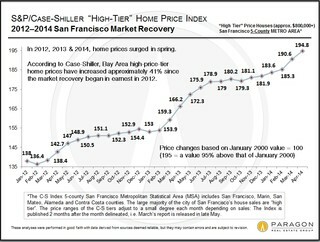 The it in this case is condominiums in San Francisco, which according to the San Francisco Business Times have seen a 19 percent increase in pricing in April as compared to last year at the same time. Specifically, that’s an increase to an average of $1,115 per square foot for new condos, according to condo marketing and research firm The Mark Co.
Prime examples of projects selling out of units include the Linea project at 1998 Market Street. Developer Brian Spiers’ project is just about sold out of its 115 units. In addition, Oyster Development’s Vida project at 2558 Mission Street has sold nearly a third of its 114 units. Set to come online later in the year are Trumark Urban’s 27-unit Amero, Bosa Development’s 267-unit Arden in Mission Bay, and Tishman Speyer’s 665-unit luxury highrise Lumina in Rincon Hill. The grand total for 2014? 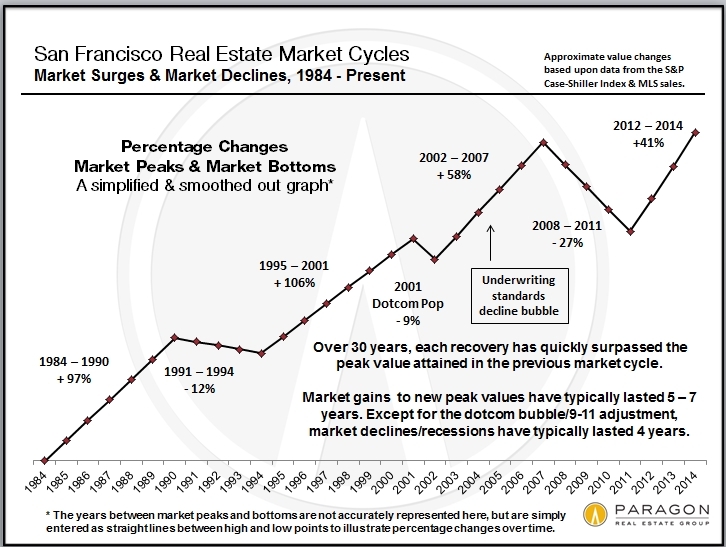 Fewer than 1,500 new condos on the market in San Francisco. Meanwhile, more than 5,000 apartments will come online. Why? As the Business Times notes, for years after the recession, it became far easier to finance apartments than condos. This is an issue that’s truly beginning to shape San Francisco – and it’s worth more than a single blog post. Let’s talk more about this tomorrow. It’s one of the oldest neighborhoods in San Francisco and one of the fastest growing; Dogpatch, long a forgotten patch of real estate on the city’s central waterfront, has big plans. Actually, it’s always had big plans. Dogpatch dates back to the mid-1850s, when gunpowder manufacturers built factories there, outside the original Yerba Buena city limits to avoid the new city’s ordinance forbidding “dangerous industries.” From that point on – and especially after the construction of a bridge leading from downtown to Potrero Hill and the Bayview District, making the district much easier to reach — and continuing through Dogpatch’s industrial prime, the neighborhood was magnet for large manufacturers like The Tubbs Cordage Company, the Union Iron Works and, later, Bethlehem Steel, for ship builders and other heavy industry. A steady flow of immigrant workers followed. They stayed in rooming houses on Irish Hill, a micro-district notorious for its rugged, brawling living conditions, located adjacent to the ship yards and factories, or they bought lots a few blocks away. On those lots they built small Eastlake-style Victorian cottages, built by hand from house plans published for free in the evening San Francisco Call Bulletin. The glory days lasted through World War II, after which the neighborhood entered a long period of decline shadowing the overall downfall of heavy industry in San Francisco. By the early 1990s, Dogpatch had all but slipped off the map, its sagging Victorian and Edwardian houses and flats occupied by longtime residents and counterculture artists. Activity at Pier 70, once the hub of neighborhood productivity, wound down to a whisper. What remained of Irish Hill was (and is) an anonymous berm, maybe 20 feet high, in a fenced-off lot owned by PG & E and the Port of San Francisco. The neighborhood’s rebirth began at the dawn of the dotcom boom. Developers looking to capitalize on Dogpatch’s proximity to Multimedia Gulch and anticipating the redevelopment of Mission Bay and the extension of the Third Street rail line built entry- and mid-level condo and live/work buildings along Third, Tennessee and Minnesota Streets, inviting new residents and revitalization; Esprit, the clothing manufacturer, set up its headquarters on Minnesota Street. A few restaurants and shops popped up on and around Third and 22nd Streets. Since then, Dogpatch’s trajectory has been consistently skyward. Today, the neighborhood is a vibrant hub comprised of a mixture of old and new. The residential heart is a four-block stretch of tree-lined Tennessee and Minnesota Streets, where a dozen of the original Victorian cottages share space with Edwardian homes and flats, small mid-rise condo buildings from the 1990s and 2000s and a few extant warehouses. Further south, the streets are populated entirely by large condo and apartment complexes, including Millwheel South, 32 units on Indiana and Minnesota Street that sold out in less than a month upon its 2012 completion. With all of this growth it was inevitable that Dogpatch would become a destination for business. In the past five years the neighborhood has seen several new arrivals, restaurants, coffee shops, bakeries, wine shops, even a butcher, plus boutiques and a brewery, the Triple Voodoo Brewery and Taproom. Some standouts are Piccono and Mr. and Mrs. Miscellaneous, whose miscellanea is actually limited to ice cream and cookies. Dogpatch has come a long way but it’s far from through. Next up is a massive project, the development of 65-acre Pier 70. Plans include commercial, retail and 1,000 apartment units, with developers hoping to start by rehabbing six historic warehouses as soon as this summer. In anticipation of what can only have a massive impact on the neighborhood, developers have already begun smaller projects nearby, creating an interesting effect along Illinois Street in which the western side of the street is gleaming new condo buildings overlooking the eastern side of the street, whose collection of faded wooden waterfront buildings resembles a Steinbeck-era Cannery Row. For several years now, all thumbs have pointed up in Dogpatch, where the future looks just as bright as the recent past. Locals are hoping the neighborhood’s funky soul stays intact, because even after two decades of growth, Dogpatch, once the rough-and-tumble embodiment of frontier San Francisco, remains a unique and special place.